Here is a fun piece for Jean at CI. 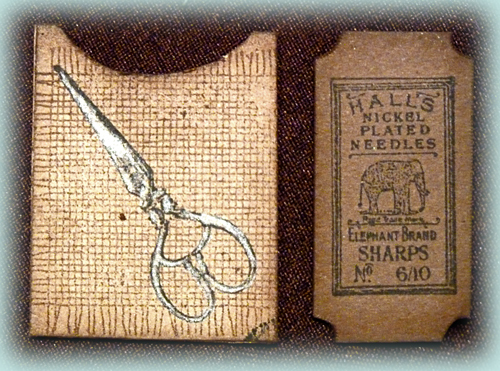 I used CI - 328 Sewing Notions stamp set. 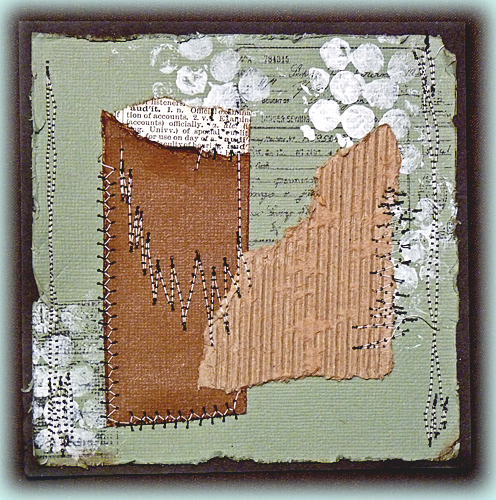 I started the design for this card after finding Heather Jacob's blog - Art and Life. I found her work very inspiring and I am sure it influenced the style and direction I took for this card. 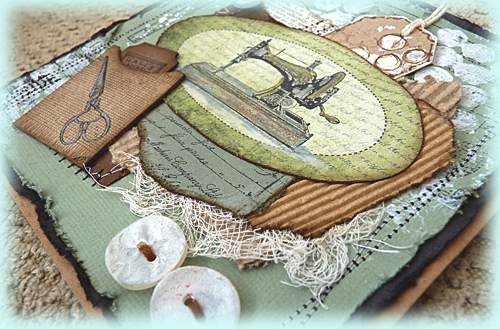 If you love arty layouts and gorgeous embellishments you will love perusing her posts. The background for my card was stamped with cash receipt, tape measure and the button card in black archival and stamped over with white acrylic paint and bubble wrap. I used various pieces of brown and kraft card, some stamped, others just inked. As the theme is sewing I just had to use the sewing machine, (but I really must get it serviced and checked). 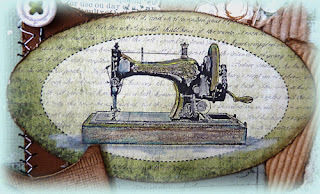 The sewing machine image was stamped over some green design paper I had and coloured with prisma colour pencils. I made the needle pack label into a little ticket and made the pocket stamping the scissors over the top again I used prisma colours on it. The hessian stamp is an oldie, but very effective. 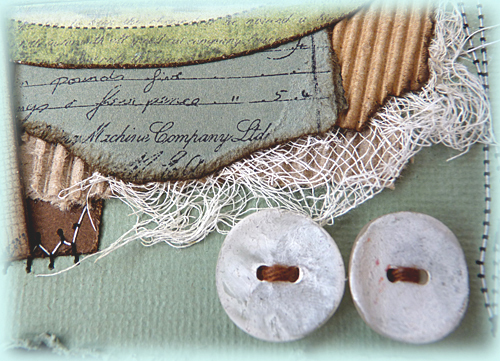 The buttons were painted with white acrylic and some also added to the white muslin. This little tag I made got a bit lost under the image, but was quite pretty. I am sure I will make more of these for collages. I have a very old splatter stamp that I used with white acrylic paint to get the effect over the little tape measure and here's another little button painted as well. also see the cash receipt stamp used again on some green card. You know I just love sewing themes so this was great fun to do. Absolutely love your gorgeous card such fab detail. Oh, Brenda, das ist so wundervoll. Ich liebe das Thema "Nähen"
Du hast das so toll gemacht, so viele Details und verschiedene Arbeitsgänge. Ich bin begeistert. Love, love, LOVE this, Brenda! I am positively drooling. Your stitching is so cool - I had never thought of using an alternate color for the bobbin - it looks fabulous! This is as close to perfection as you can get - in my mind - LOL. You are generous to take the time to photograph the various stages. It is a fabulous stamp set and you have showcased it so beautifully (love the colours). Absolutely stunning! I adore the background and every little details ... gorgeous. How incredibly beautiful, dear Brenda! You are always so inspiring! Gorgeous layers and textures, love all the Fab details. a stunning tag with a lot of beautiful layers! Your art work is so pretty :) I invite you to my blog. Oooh, love the sewing and splattering and layering! I really wish I knew how to use my sewing machine. Perhaps you could wing over in your spare time and give me a tute? Thanks, hon! so many beautiful details. stunning composition! Brenday, I am not sure where to start! Love the stamped background with black and white paint! Actually I love the bits of white paint along this most gorgeous card! You reminded me that I need to pull out my sewing machine and get it tuned up!!! Poor baby has been so ignorned. Love this card and all the fabulous details! Hugs again! Just lovely, especially all the layering. Thanks so much for sharing. What an awesome collage of images, Well done! 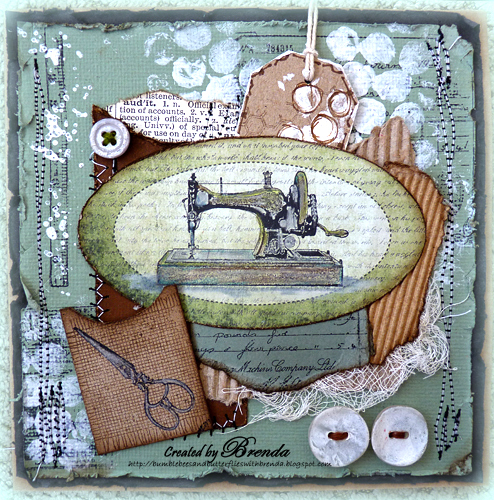 Hi Brenda, This is so gorgeous, love the soft vintage colours on this, and so much detail.